Thanks to the indefatigable Merrillee Malwitz-Jipson of Our Santa Fe River and all the Floridians Against Fracking (WWALS is a member) who stopped this bogus bill. 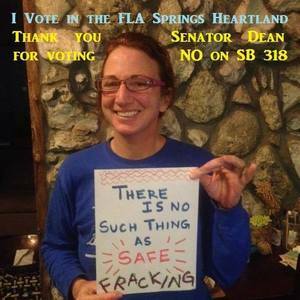 TALLAHASSEE — The Senate sponsor of a controversial bill about the regulation of “fracking” in Florida withdrew it from consideration Tuesday, saying he didn’t have the votes to get through a key committee. “Emotions tend to magnify the controversy,” he said. Well, yeah, people do tend to get emotional about their drinking water, their springs, their tourist economy…. No sane civilization injects poisons under its drinking water source. There is no safe way to regulate fracking other than to ban it outright. Next year: prohibit fracking in Florida, like New York State already did. Meanwhile: numerous local governments have already passed resolutions against fracking. And now to defeat Spectra Energy’s Sabal “Sinkhole” Trail fracked methane pipeline boondoggle. This entry was posted in Aquifer, Fracking, Quantity and tagged Aquifer, conservation, Florida, Floridians Against Fracking, fracking, Merrillee Malwitz-Jipson, north Florida, Quantity, river, south Georgia, watershed, WWALS, WWALS Watershed Coalition on March 2, 2016 by jsq.